Water is the most plentiful solvent on Earth, is easily purified, and is not toxic. It is, therefore, widely used as a medium for chemical analyses. ** Most of the solutes we will discuss are electrolytes, which form ions when dissolved in water (or certain other solvents) and thus produce solutions that conduct electricity. ** Strong electrolytes ionize essentially completely in a solvent, but weak electrolytes ionize only partially. These characteristics mean that a solution of a weak electrolyte will not conduct electricity as well as a solution containing an equal concentration of a strong electrolyte. 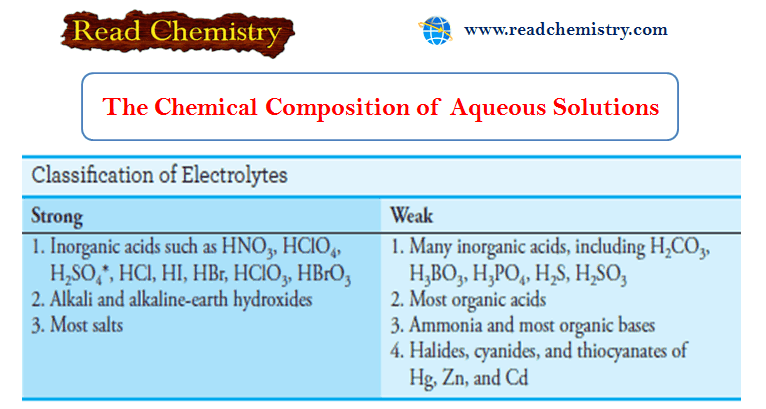 ** Table (1) shows various solutes that act as strong and weak electrolytes in water. Among the strong electrolytes listed are acids, bases, and salts. ** In 1923, J. N. Brønsted in Denmark and J. M. Lowry in England proposed independently a theory of acid/base behavior that is especially useful in analytical chemistry. ** According to the Brønsted-Lowry theory, an acid is a proton donor, and a base is a proton acceptor. For a molecule to behave as an acid, it must encounter a proton acceptor (or base). Likewise, a molecule that can accept a proton behaves as a base if it encounters an acid. ** This reaction proceeds to an extent that depends on the relative tendencies of the two bases to accept a proton (or the two acids to donate a proton). Examples of conjugate acid/base relationships are shown in Equations (1) through (4). ** In this reaction, ammonia (base1) reacts with water, which is labeled acid2, to give the conjugate acid ammonium ion (acid1) and hydroxide ion, which is the conjugate base (base2) of the acid water. ** The conjugate base of the acid HNO2 is nitrite ion. The conjugate acid of water is the hydrated proton written as H3O+. This species is called the hydronium ion, and it consists of a proton covalently bonded to a single water molecule. 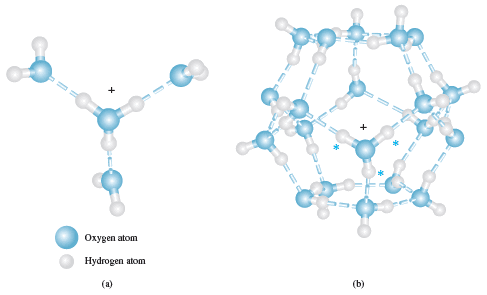 ** Higher hydrates such as H5O2+, H9O4+, and the dodecahedral cage structure shown in Figure (1) may also appear in aqueous solutions of protons. For convenience, however, we generally use the notation H3O+, or more simply H+, when we write chemical equations containing the hydrated proton. (1) A salt: is produced in the reaction of an acid with a base. Examples include NaCl, Na2SO4, and NaOOCCH3 (sodium acetate). (2) An acid: donates protons. A base: accepts protons. (3) An acid donates protons only in the presence of a proton acceptor (a base). Likewise, a base accepts protons only in the presence of a proton donor (an acid). (4) A conjugate base: is formed when an acid loses a proton. For example, acetate ion is the conjugate base of acetic acid. Similarly, ammonium ion is the conjugate acid of the base ammonia. (5) A conjugate acid: is formed when a base accepts a proton. (6) A substance acts as an acid only in the presence of a base and vice versa. ** Water is the classic example of an amphiprotic solvent, that is, a solvent that can act either as an acid (Equation 1) or as a base (Equation 2), depending on the solute. (1) A zwitterion is an ion that has both a positive and a negative charge. (2) Water can act as either an acid or a base. (3) Amphiprotic solvents behave as acids in the presence of basic solutes and bases in the presence of acidic solutes. ** Amphiprotic solvents undergo self-ionization, or autoprotolysis, to form a pair of ionic species. ** The extent to which water undergoes autoprotolysis at room temperature is slight. Thus, the hydronium and hydroxide ion concentrations in pure water are only about 10-7 M. Despite the small values of these concentrations, this dissociation reaction is of utmost importance in understanding the behavior of aqueous solutions. ** Figure (2) shows the dissociation reactions of a few common acids in water. (a) The first two are strong acids because reaction with the solvent is sufficiently complete that no undissociated solute molecules are left in aqueous solution. (b) The rest are weak acids, which react incompletely with water to give solutions containing significant quantities of both the parent acid and its conjugate base. ** Note that acids can be cationic, anionic, or electrically neutral. The same holds for bases. ** The acids in Figure (2) become progressively weaker from top to bottom. Perchloric acid and hydrochloric acid are completely dissociated, but only about 1% of acetic acid (HC2H3O2) is dissociated. Ammonium ion is an even weaker acid with only about 0.01% of this ion being dissociated into hydronium ions and ammonia molecules. Another generality illustrated in Figure (2) is that the weakest acid forms the strongest conjugate base, that is, ammonia has a much stronger affinity for protons than any base above it. Perchlorate and chloride ions have no affinity for protons. ** Perchloric acid is, however, about 5000 times stronger than hydrochloric acid in this solvent. Acetic acid thus acts as a differentiating solvent toward the two acids by revealing the inherent differences in their acidities. Water, on the other hand, is a leveling solvent for perchloric, hydrochloric, and nitric acids because all three are completely ionized in this solvent and show no differences in strength. There are differentiating and leveling solvents for bases as well. ** The common strong bases include NaOH, KOH, Ba(OH)2, and the quaternary ammonium hydroxide R4NOH, where R is an alkyl group such as CH3 or C2H5. ** The common strong acids include HCl, HBr, HI, HClO4, HNO3, the first proton in H2SO4, and the organic sulfonic acid RSO3H.